Time to consider the best diaper bags for twins. I bet the first time you headed out the door with your new babies, it was controlled chaos. A million things on your mind, checking and rechecking everything, eyes on both kids at once as well as everything else. But with a little bit of practice, it becomes so much easier. Once you know what you need and where everything is, it's simple to just grab what you need and head on out to conquer the day, twins in tow. And the easiest way to keep everything in one place and organised is to have a great diaper bag. A well packed diaper bag for twins is like a military operation. Everything's planned out to the last, because once you've got a few miles from home and realized you've forgotten to pack the pacifiers, you won't make that mistake again. With twice as much to pack, diaper bags for two babies are doubly so. First off, why even get a diaper bag diaper bag for twins? Why not just use a bag you already own? There's actually a few good reasons for this. They're going to sound really obvious when you hear them, but most things are once you sit back and think about it. Reason 1: They have, like, a million pockets. Okay, maybe not a million, but diaper bags tend to be divided into so many more pockets than normal bags. The interiors are specifically designed around what you and your babies need. Reason 2: Your other bags aren't waterproof. Or, you know, other stuff proof. You only have to have one accident to ruin a bag. But a lot are machine washable, and a lot come with extra fluid resistant pockets for anything that would be damaged beyond repair by unfortunate spills. Like, say, your phone. Most also come with a changing mat built in. Which I can guarantee a Hermes doesn't have. The reviews of our favorite twin diaper bags are below. Read on to find out which is the best option for you and your family. I bet your handbag doesn't have stroller hooks, so you can hang it up on your stroller for quick and easy access? How about a pocket for baby wipes with a zipper that opens right over the access, allowing you to grab one in seconds? The guys who make baby products are smart. A good diaper bag for twins will have options you didn't even know you needed until they came into your life. So you were on the fence but now you're convinced. But what to look for? Enough storage space: Enough storage space is king when it comes to diaper bags, especially when you're packing for twins. Nothing worse than shoving everything into the same couple of pockets, because you can always guarantee that whatever you need is going to be on the bottom. Outer pockets: When you're looking at storage, think about outside pockets as well. You can put everything you use often into these things, so they're instantly ready in case of emergencies. Waterproof and cleanable: Accidents happen, and even if they don't, you're going to want to be able to wash your bag, and often. Being able to throw it in the washer is a massive help, and a huge time saver. Easy to carry: There's a lot of options with bags. Tote style, over the shoulder, backpack. In my opinion, it's best to buy something that you can hold hands free. If possible, grab something with more than one option. Variety is good, and they can get heavy, so being able to shift the weight is a lifesaver. Solid construction: Your poor bag is going to take a lot of punishment in the coming months, so get something well built that isn't going to fall apart after a few weeks. A little more money spent up front can save you a hell of a lot of time and aggravation in the long run. Built in changing pad: Most bags come with one of these, and they normally slot into a special pocket. This is great as it keeps everything else clean and sanitary, so it's worth checking out. Weight: You're going to load this thing up, so buying a bag that's lighter when empty will save your shoulders some strain. Design and color: There's hundreds of different designs and colors available, but don't just choose for style. Bear in mind lighter colors will show stains and mess a lot more. This isn't a problem if the fabric your bag is made from is waterproof and wipe clean, but it's still going to show. If in doubt, go for darker colors and tougher, more resistant fabric types like nylon or microfibre mixes. Space for you: You're probably not going to want to carry two bags, so if there's any space left in the diaper bag for twins after everything else goes in, then in goes the purse, phone and keys. If you're going to be doing this, you're gonna want a nice, secure and waterproof pocket just for you. Nothing worse than leaving your keys in a coffee shop restroom or getting talc all over the front of your shiny new phone. One major tip I've found for new moms is to make a list of everything that you're going to put into it. Or even go one better and lay out everything on the kitchen table. It's actually quite eye opening to realise just how much you're going to be packing into this thing, especially when you're packing for twins! Plus, having it all there in front of you helps to kick start the memory and remind you of anything you might have forgotten. Lastly, think about when you're going to use your diaper bag. How often you're going to be using it and how far you're regularly going to be travelling with it. If your days involve a lot more walking than normal then you're going to want a bag that's more comfortable than most, for example. Honestly, I would buy this to use as a backpack for when me and my partner go hiking. It's that smart, and easily one of the best diaper bags for twins on the market. A classic black design that's unobtrusive enough to go with almost any look, and a really comfy back strap system to spread the weight around mean that it's a delight to carry, even on longer journeys. Once you crack it open and get inside, it only gets better. There's 11 pockets, with the important ones being instantly accessible from the outside. Because it's a backpack it's a lot deeper than some bags we've seen, with a really generous internal space that will easily fit everything you need. A insulated side pocket as well as included insulated cube storage pack mean that bottles, sippy cups and snacks are kept at the right temperature. There's a changing pad that slots straight in, as well as a dry bag just in case! Despite all this, it's still really light, which is great, especially when you're hanging it from a stroller by the attached straps, or slinging it over your shoulder for a long day's walking. Plus, it stays upright no matter what's in it. That's almost a dealbreaker for me and this is definitely a diaper backpack to invest in. Really big, inside and out. Take everything you need. Take everything you don't as well! A tote design with a colossal amount of carrying space, this diaper bag for twins is a perfect choice for any mom who likes to go out prepared. With the huge internal area and nine separate pockets, you can pack everything you could ever want into this, plus more. It's easy to carry, with three different options for carrying it. If it's too heavy to carry with the handles, sling it across your shoulder. If you need a rest, attach it to your stroller and carry on! It's also really stylish looking. Distinct without being ugly, and it's neutral enough to not clash with anything you might want to go out in. The only real issue I have is the fact that the outside isn't very stain resistant. It wipes clean, but over time, the material picks up little discolored marks that spoil the look. However, if you're careful, or like people to see these scars and know that you're a battle hardened mom whose been through the trenches, this is a really good diaper bag with everything you could ever need. The little sister of the bag above, this tote shares most of the same great reasons to buy, just scaled down. For a start, for a smaller bag, it's got a deceptive amount of internal space, with seven big pockets that make keeping everything in place really easy. Second, there's loads of ways to carry it, and it's really simple to move around, even when it's fully packed. For some reason, even when this is full, it feels less bulky than other bags. Unfortunately, that's also a little bit of an issue. I like to be prepared, and there's not enough space in this compared to our two top choices. It's still a fantastic option, and I'd recommend it, but probably not as a main bag for anyone with twins. If you're looking for a brilliant secondary diaper bag for twins, one you can grab and bring with you when you're just nipping out, this is perfect. If you're looking for a one size fits all bag, grab something a little bigger. From the outside this diaper bag for twins reminds me of the sort of bag you'd buy for a high end camera. It's got that sort of profile. It also looks really tiny, especially compared to some of the bags I've seen other women with. But don't let that deceive you. Once you get it open and look inside, you'll realise the manufacturers did some sort of magic when they made this. It just goes on and on inside. It's probably something to do with the fact that it's really deep, when a lot of bags are just tall and wide. This is another top option. This could be a problem, meaning you have to fight to get to the bottom of the bag, except the outside pockets all lead exactly where they need to be. There's even a dedicated wet wipe pocket, which gives you instant access to wipes when you need them most. It's another backpack, and sits comfortably on the shoulders, so don't worry about carrying this for long periods of time. There's also the option for stroller straps, and a carrying handle on top that makes picking it up really easy. A few people reported minor issues with zips and seams breaking, but that just seems to be a minor problem. There's a full guarantee anyway, just in case anything goes wrong. Overall, this is a really good little bag, with a lot to love. But I'd still probably buy the Shona backpack. If you have your heart set on this though, don't let us put you off. You'll love this from the first moment you sling it over your shoulder. Our last diaper bag for twins on this list, which also happens to be a nice-looking backpack, has the largest amount of internal space out of everything we've looked at, so if you're going for the maximum amount packed, this is the bag you're going to be looking at. It's huge inside, with a few really big pockets that hold everything they need to. It would have been nice to see more dedicated compartments, but it's roomy enough inside that you can just keep the essentials in the pockets and still find anything you need. It's an unobtrusive design, and wouldn't look out of place by the side of a businessman on a train, which makes this great for parents who like to share the load. It's also made from really tough nylon, and completely waterproof, so if you want a robust backpack style diaper bag, this is for you. This is a great extra large diaper bag. Aside from keeping baby stuff, the backpack has three (3) insulated pockets that keep beverages, milk, and other fluids at the desired temperature. It is designed with easy to reach pockets. So you can keep baby wipes, sanitizers, overnight diapers and other important items in easy access pockets on the side. 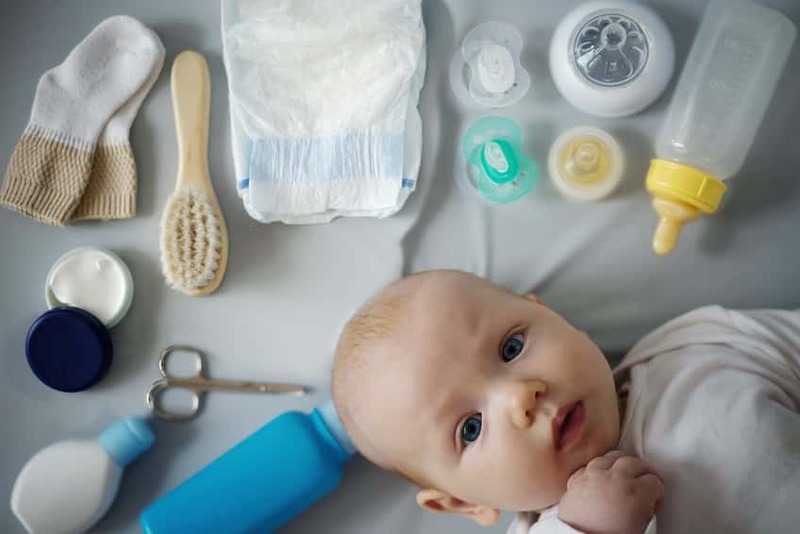 The bag is designed to fit all of your baby care items such as diapers, changing pads, bottles, a change of clothes, blankies, toys, and more. There are 15 pockets that you can use for any item that you may need. The bag has enough space for all your baby’s things, but it is also light enough – 1.6 lbs. – to carry without adding additional stress to your back. The material is made out of high-quality cloth that is sewn securely at the seams, preventing any tearing if you manage to pull too hard. It is also designed to withstand gradual wearing of the fabric. The bag will look good as new for a very long time. The zippers are made of heavy-duty iron with a lock slot on the zipper, keeping you and your baby’s things safe while you are outside or traveling. The adjustable straps and buttons allow you to hang the bag on your stroller or on a hook at home for easy access. The padded straps let you wear the backpack conveniently and comfortably as well. This large diaper bag for two is made of high-quality and durable oxford fabric. It has easy access tissue pocket, back pockets, and comes in a cute bright color with nice interior lining. The bag remains in shape even when full. It is durable and water-resistant. Any milk or water spilled inside the bag can be easily cleaned without worry that it may damage the bag. The bag is large and has several compartments, storage pockets, and insulated pockets where you can put all your baby’s necessities such as water and milk bottles, diapers, clean clothes, towels, wet clothes, and some of your personal things, too. It doesn’t look too huge on the outside when worn, but you will be amazed by how many things you can put inside. This elegant and stylish diaper bag can be used as a backpack and a handbag. It is suitable for everyday use and even for special occasions. The price is great for its cute design and multi-function use. It also comes with a warranty. As the proud parent to a pair of twins, you need to be prepared. So grab one of our top picks and you can relax, knowing that you're getting one of the most practical and helpful best diaper bags for twins on the market.